Alto saxophonist Caroline Davis was kind enough to stop by AirPlay in early December for a solo set. 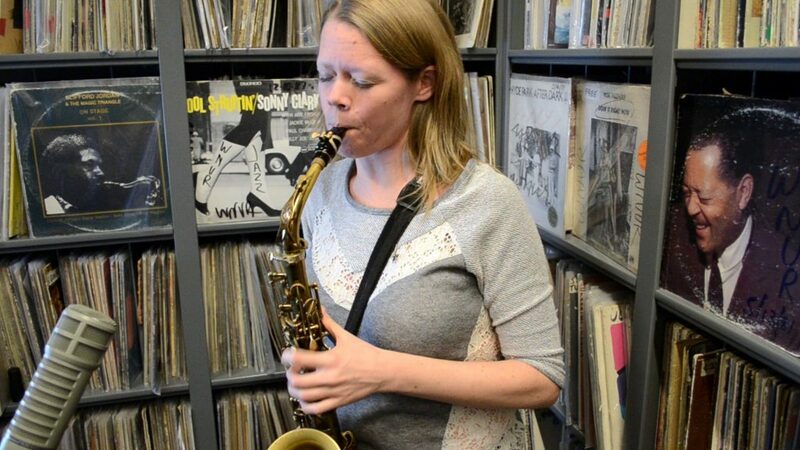 The Northwestern alum and former teacher gifted us a soulful rendition of Warne Marsh’s “Background Music” against the background of WNUR’s jazz collection. The WNUR Media Team captured it on video. With a background like hers, it makes sense that Caroline Davis turned out to be such an intriguing artist. She was born in Singapore in 1981 to European parents—her father was a British engineer, her mother a Swedish actor. She was raised in a primarily African-American section of Atlanta, where she fell in love with gospel and R&B. And she spent her teens in the very different setting of a middle-class Dallas suburb, where she played saxophone in her junior high band, influenced by her parents’ love of Michael Jackson, Steely Dan, Stevie Wonder, Blood, Sweat & Tears, and other rock and soul bands with horn sections. Having covered so much ground geographically, she continued her travels as a student of music, going beyond the ABCs of notes and chords.